An eight-year-old pupil from Dubai has challenged schools to radically reassess curriculums to allow room for more relevant, modern subjects. Adam El Rafey claimed the current academic focus was too rigid and held children back by limiting their creativity. Speaking at an education conference in the emirate, he called for classes in robotics, social media and artificial intelligence. He said learning about how to make a YouTube video or to spot bullying behaviour was just as useful to pupils today as more traditional subjects. “My mum learned in the same way that I’m being taught and we need to change that,” said Adam. Adam made his remarks at the annual Global Education Supplies and Solution conference in Dubai. The event aims to bring together experts from around the world, allowing key decision makers to discuss new ideas in the sector. Organisers said the pupil at Jumeirah English Speaking School in Dubai was the youngest speaker to address the conference. The star pupil also won three gold medals at the 2018 Olympiad in UAE, an annual, international exam which covers English, maths and science. “Sometimes school cuts us off,” Adam said. “For example, if I am in the middle of a piece of writing and then the teacher comes and tells us it’s time for the next subject. Adam’s mother, Soha El Halfawi, told how the youngster had started reading at the age of one, without having been taught. He has since continued his obsession with learning, even completing 12 robotics courses at organisations accredited by the Knowledge and Human Development Authority, Dubai’s private school regulatory body. Speaking to The National, Adam urged schools to allow children to experiment, to tackle different academic projects and to enjoy more field trips. He also said lessons in social media were crucial to modern schooling, and that banning children from online platforms was not the answer. “Schools should teach pupils how to manage social media,” he said. “They should face up to the issue and have a class on social media. Don’t tell me to limit screen time but tell me how to make a proper YouTube channel. Ms Halfawi described how her son’s curiosity had proved boundless even from an early age. “I have videos of him when he was a two-year-old identifying all the flags in the world," she said. "Then he got interested in cars and memorised all the logos. He would look at cars while driving by and cry out names of brands like Peugeot and Ferrari." Today, Adam’s bedside table is crowded with books on physics and astronomy, including authors Randall Munroe and Stephen Hawking. Ms Halfawi said she was often amused to find titles hidden under his pillowcase and in his bathroom. “Vanadium is my favourite element [in the Periodic Table], not just because of its bright red colour but it’s also the ingredient for strengthening metal," Adam said. Public schools are transformed into social hubs in an attempt to promote a culture of participation and engagement. Five community schools were opened in Abu Dhabi emirate on Sunday. Two opened in Al Ain, one in Abu Dhabi city and the remaining two schools in Al Dhafra. Community schools are newer public schools that have been enhanced by the Abu Dhabi Department of Education and Knowledge. Pupils benefit from more activities and classes, while the school itself becomes a social centre for the community. Last year, Adek said it planned to transform 30 public schools into community schools in the capital by 2020. The schools are meant to serve as social hubs to meet community needs, enhance pupil-parent relationships and promote a culture of participation and engagement. The project focuses on six areas, including science, sports, health, culture, national identity, and pupils with special needs. Dr Yousef Al Sheryani, ADEK’s undersecretary, said the goal of the project is linked to the country's education vision because it promotes the role of a school as a cultural hub, while creating an attractive educational environment to support talented pupils. The new community schools in the Emirate of Abu Dhabi include: Mleih School in Abu Dhabi, Al Shaheen and Um Ghafa schools in Al Ain, Al Abbas Bin Abdul Muttalib School in Al Ruwais, and Dalma School in Dalma Island. Our definition of failure defines more about us than we may realize, because the fear of failure is one of the most frequent sources of creative paralysis. When the perceived threat of potential consequence outweighs the perceived benefits of success, we stop acting. Improving technology and changing expectations of work and family from millennials are giving rise to a new office arrangement: the coliving/coworking space, often on the beach but always somewhere far away. It's like WeWork meets an upgraded hostel (in paradise) with free coffee, fast internet, a kitchen and quiet spaces, along with all the serendipitous meetings and experiences that make travel great. Leading the charge are companies like Selina, Outsite and Roam, which are opening locations across the globe to meet the demands of today's digital nomads. Today, I’m part of a panel on the “Future of Work in an Era of Automation and Artificial Intelligence” at the Business Roundtable’s CEO Innovation Summit. This is a topic we’re often asked about at Walmart: what will jobs look like in the future, and how should we be preparing people for those roles? When I consider this issue, I think back to my first job as an hourly associate in a distribution center, unloading Walmart trucks in the heat of an Arkansas summer. Our unloading processes in stores have been largely unchanged for three decades. This year, however, they are changing. We’ve begun modernizing our backrooms with a new technology called “FAST Unloader.” Associates take merchandise from the truck and place it directly onto a conveyor. The technology then scans and sorts the items. It takes 1/3 the time, and we’re seeing increases in sales and reductions in turnover in what had been a very difficult job to fill. Improvements like this are happening across Walmart – our stores, our supply chain, and our eCommerce operations. 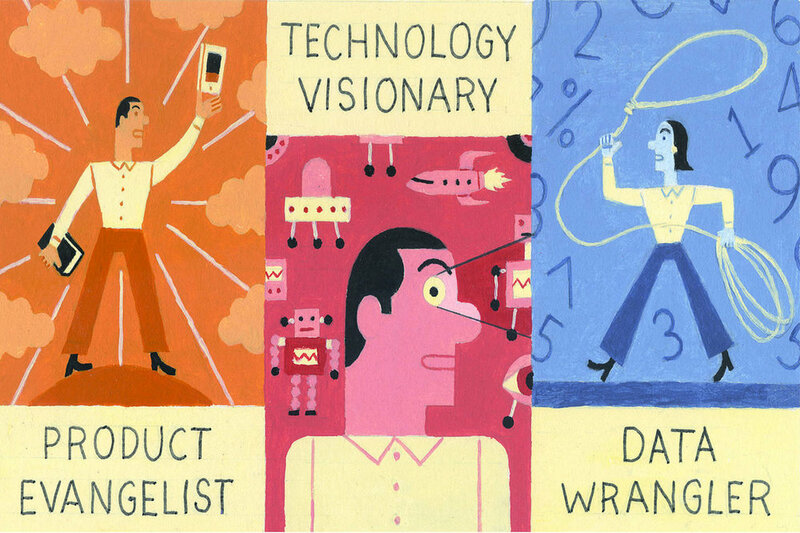 We’re looking at our jobs through the lens of technology and asking ourselves which human tasks add value – and which should be automated to improve the associate experience, customer experience, and sales. We’re exploring shelf scanners to monitor our inventory levels, an autonomous floor scrubber (think industrial-grade Roomba), and robotic technology that speeds the process of picking items for Grocery Pickup. At the same time, we’re investing in associate-facing apps and technology to enhance how our associates work and learn. For example, we’re using virtual reality headsets to train associates on the FAST Unloader before it even arrives in their store. The overall trend we’re seeing is that automating certain tasks gives associates more time to do work they find fulfilling and to interact with our customers. We consider those interactions a competitive advantage now and in the future. We’re also seeing reduced turnover in our stores. Another trend in the broader retail industry is that stores are likely to have fewer positions in the future. Although we will continue to have large numbers of jobs at all levels, we think our stores will follow that trend. The industry’s turnover rate means we can largely manage the overall number of store associates through attrition. Additionally, the progress we’re seeing from technology indicates that, over time, our roles can be higher-skilled and higher-paid. This is the future we’ve been preparing for as it relates to training and paying our people. We’ve invested more than $4 billion over the past four years in higher wages, training and education. We’ve built 200 in-house training academies that teach retail and management fundamentals and focus on soft skills and leadership skills. We’ll have trained nearly 500,000 associates by the end of the year. We’re also offering a college benefit, where an associate can earn a college degree for the equivalent of $1 a day. We want every associate to be better off for having worked at Walmart. We’ve increased our starting wages by more than 50 percent in the last three years, and we’ve invested in adoption, parental leave and education benefits at the same time. Let’s not get stuck, however, thinking about starting wages only. There can be unintended consequences of that focus. For example, raising the start rate at some companies ends up capping compensation for those who stay for years. That’s why Walmart has some of the widest pay bands in the industry. Hourly associates who have been with us, worked hard and moved up in our stores can make more than $24 an hour. Additionally, smart employers reward their teams well beyond base wages. We currently have an average total compensation and benefits for hourly employees of more than $17.50 an hour when accounting for regular and overtime pay, a 401k match, health care, associate discount, paid time off, and a quarterly bonus more than 1 million of our associates earned last year based on store performance. That figure amounts to $19.99 for full-time hourly employees. The workplace is going to look different in a few years – not just in retail, but across the economy, and we’re trying to be thoughtful about that transformation and bring our people along. We have been very deliberate about our job offerings, and we will continue listening to our people and investing in the training, benefits and wages they tell us are important. We’re creating a company that is people-led and tech-empowered. Our people made the difference yesterday, just as they do today, and just as they will tomorrow. Are you a ninja, a rockstar or an evangelist? Schools are places for learning. Places where the next generation is educated and prepared for the future. The current school system was designed in a different context to meet the needs of the previous century. If we want to prepare children to live and act in the future society, it is not enough to improve literacy and numeracy. Changes in our society like globalization and digitalization together with the increasing demand of people who can innovate and collaborate means that we have to rethink education and reinvent schools. Students need a foundation of basic knowledge, but as information can now be found anywhere it is even more crucial to know how to apply the knowledge. Practicing skills like creativity, critical thinking, communication and collaboration requires new school concepts that relates to the educational model and support the new way of learning. We think it is important that schools for our youngest learners provide spaces that are welcoming and ease the delicate transition from home to school. Scale may be the most important factor in creating an unintimidating and familiar space. Scale means understanding details, from the size of the furniture to the incorporation of the appropriate technology. It could also mean organizing the facility into smaller, more comprehensible components better suited to small learners. The design of 21stcentury elementary schools requires attention to myriad interrelated issues from pedagogy and technology, cognition and perception, demographics, budget, community to cultural goals and values. The overarching need is to ensure the future of our communities by educating our children in facilities that are welcoming, safe and supportive. 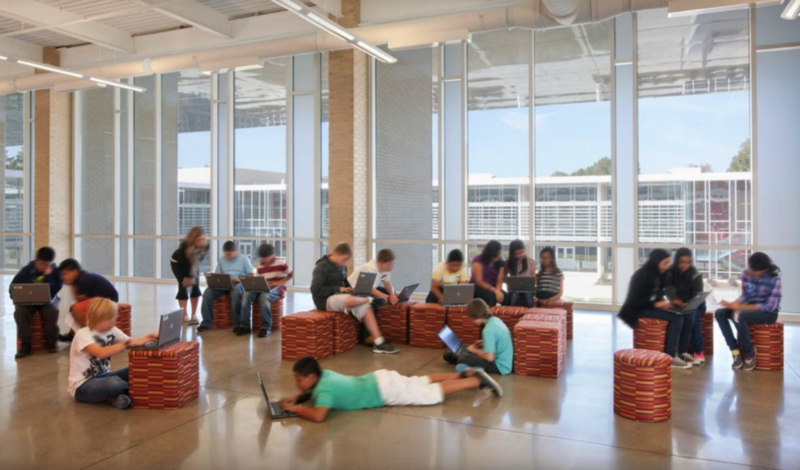 Creating the best learning environment for the middle school years – a time when students are going through physical, intellectual, emotional and social changes – requires thoughtful design. We believe middle school facilities should provide a natural transition between the self-contained world of elementary school and the high school world that inspires both academic and personal exploration. Research has shown that when young adolescents are engaged in their own learnings, they are much more likely to achieve at higher levels. A strong priority on collaboration, vision and culture should be placed during the planning process in order to design middle schools that promote engagement among students. Today's traditional high schools must be nimble enough to evolve into the high-performing schools of tomorrow—not only for their students and teachers but for entire communities. Secondary schools are called on to prepare students with the perspectives and skills they need to succeed in the future. Solving real-world problems, using industry-standard tools, and enjoying mentorship by real employers, students experience sustainable growth and make lasting contributions during their formative high school years. To introduce a new school concept is not a small operation and is of course followed by several challenges. For example, how should the projects be assessed and translated into individual grades and how can already practicing teachers adopt the new way of teaching? Rethinking schools is also highly political and includes actions on different levels. Is it possible to redesign schools on a grass root level or will it have to start from a national directive? What will schools be like in the future? What will be considered relevant competence and how are these learned? Questions like these cannot be answered, but we can be relatively sure that schools will not be what they used to be and teaching in the future schools will not be the same as teaching has been in traditional classrooms. Countries in the Gulf Cooperation Council (GCC) have made tremendous progress in the past decades, building cities at the forefront of innovation, becoming global leaders in select industries, and continuously expanding their global aspirations. However, even with decades of economic expansion and extensive investments in education, infrastructure projects, and economic diversification, high youth unemployment rates persist. Experts acknowledge that youth unemployment is a complex phenomenon emanating from a multitude of converging factors. However, there is a wide agreement that one of the major factors in the GCC is due to the lack of alternative educational systems. Our current world is evolving more rapidly than the capacity of any existing educational system. The challenge of learning is getting even harder for the next generations. According to one popular estimate, 65% of children entering primary school today will ultimately end up working in completely new job types that don’t yet exist. In such a rapidly evolving employment landscape, the ability to anticipate and prepare for future skills requirements, job content and the aggregate effect on employment is increasingly critical for businesses, governments and individuals in order to fully seize the opportunities presented by these trends—and to mitigate undesirable outcomes. Imagine students accessing multiple learning pathways in a school that will empower a new generation of environmental and social change makers. Imagine students in a school where they learn to think like designers as they acquire complex skills and knowledge. Imagine students conducting high-impact research alongside educators and experts in a school that builds community by saving the community. Imagine students in a school that looks and feels like a research lab or design studio, where curiosity is cultivated to unlock endless discovery. Imagine students in a school committed to unlocking their individual potential, creating new academic opportunities and connecting them around with local businesses. Imagine students in a networked school, where educators and community professionals guide and support them along a uniquely designed learning path. Imagine students in a school within the local museum, actively learning from the region's history while contributing to the revitalization of their own city. Imagine students in a school at the forefront of emerging technologies, where the core of their learning experience integrates humanities, STEM (Science, technology, engineering and mathematics) and global citizenship. Imagine students in a school that gives displaced and disconnected youth powerful pathways to college, career and life. Imagine students in a school that engages them in local and global challenges while inspiring both social-emotional and academic growth. Tackling these challenges needs the concerted effort of all stakeholders in society. While governments must create the enabling environment that promotes inclusive growth and employment, facilitates quality education and skills development, and provides safety nets for those that are marginalized, it is critical that business, civil society and the education and training sector are also engaged in identifying and implementing solutions. I hope that this article will serve as a call to action to more stakeholders to join the momentum towards solutions to an issue that is critical to our future. Ultimately, its through collective actions that change can can occur and that unemployment disrupted.